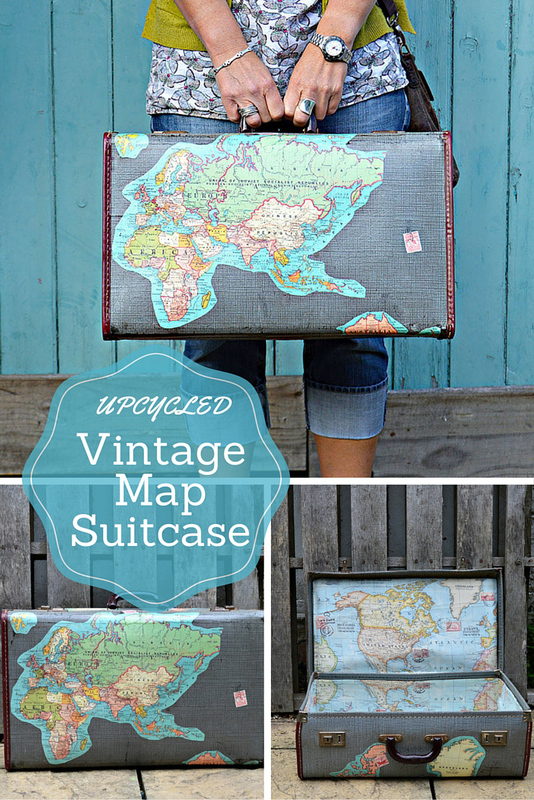 I love decorating with maps and for my latest project transformed a vintage suitcase with them. This upcycled map suitcase is the new storage place for all my travel memorabilia, photos, trinkets, maps etc that I collect on my holidays. It also looks great next to my upcycled personalised map chairs. I’m a bit of a hoarder when it comes to fabric, yarn, paper and other crafting paraphernalia. Ideally I would love to have it all on display in my own studio but unfortunately, that’s not possible. Also if my stash was visible to everyone then the extent of my craft hoarding habit would be laid bare for possible criticism! Overall, I have found that vintage suitcases are a stylish way of storing my secret craft treasure. My collection includes a case for my yarn stash, (well some of it), and another is full of stationery including my washi tape addiction. 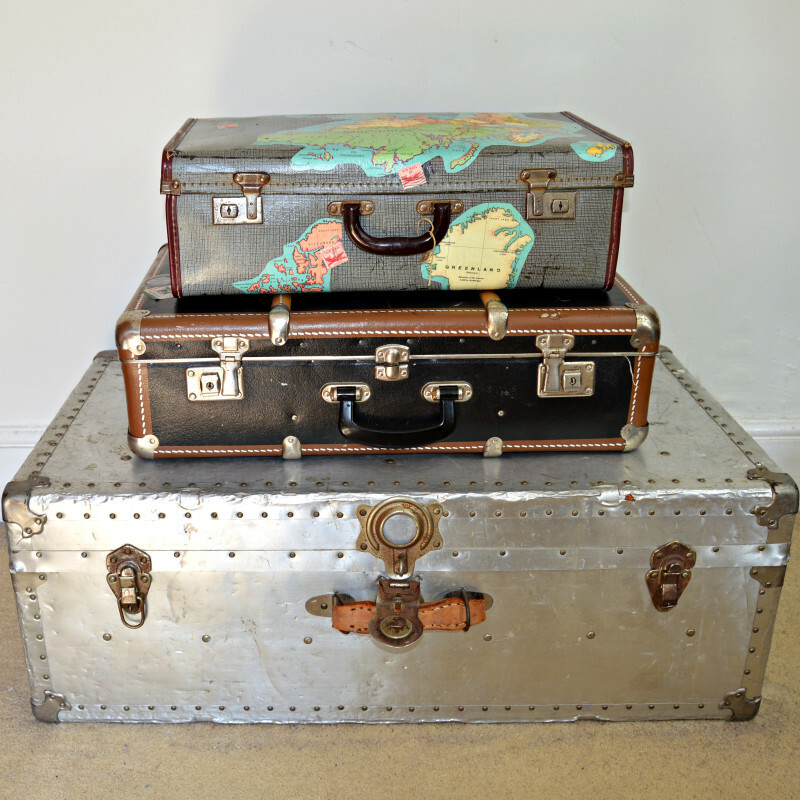 Vintage Suitcase – I bought mine for £2 it was a simple cardboard suitcase with a few scratches but as you are going to decoupage it you can cover the majority of them. The main thing to make sure is that the hinges and the catches on the case work fine. Cavallini world map wrapping paper and postage stamps. Map fabric for the inside. 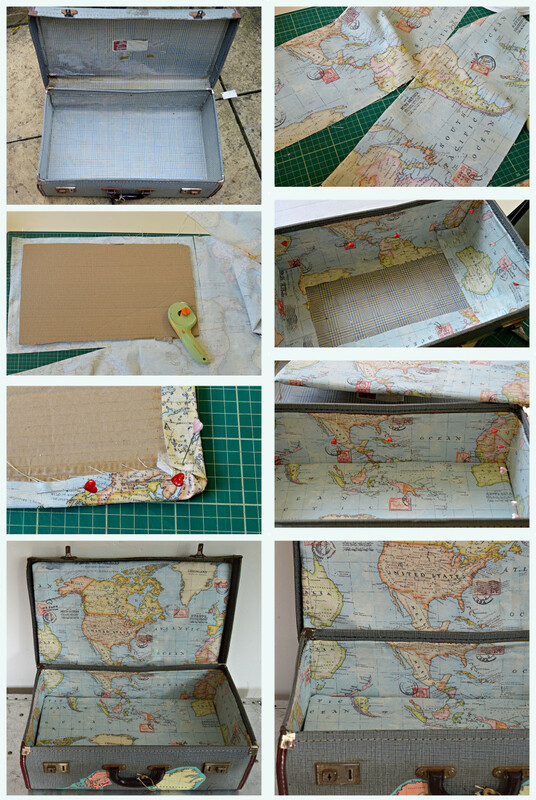 I upcycled my map suitcase in 2 stages; firstly I decoupaged the outside with paper maps and then lined the case with fabric. I didn’t cover the whole of the suitcase with maps I just cut out bits and stuck them on as I still wanted to see the vintage case underneath. The map is for decoration and to add interest not to cover up the whole suitcase. I wanted to achieve a look similar to the suitcases my friend Lisa Tiley from U Old Bag makes and sells. 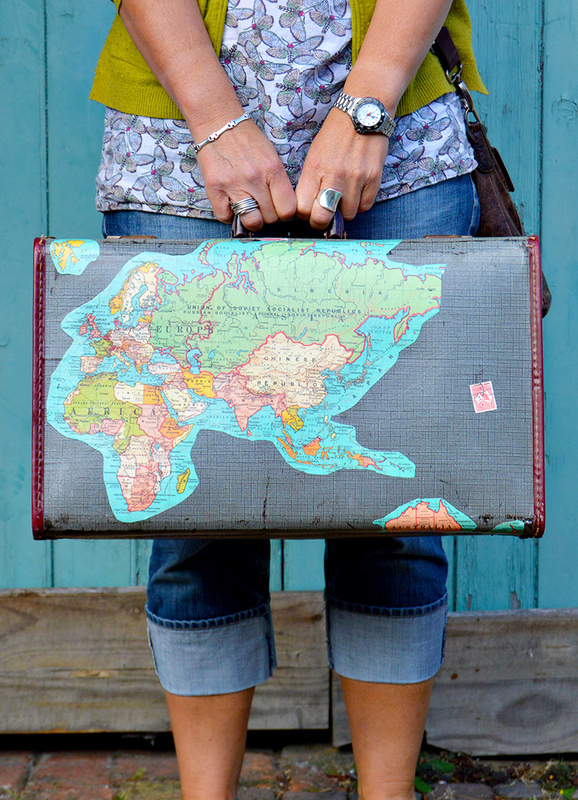 I love my map suitcase and may use it out and about and not just for storage. I bought another vintage suitcase at the same time I acquired this one and I transformed it into a fabulous travel themed vintage suitcase side table. 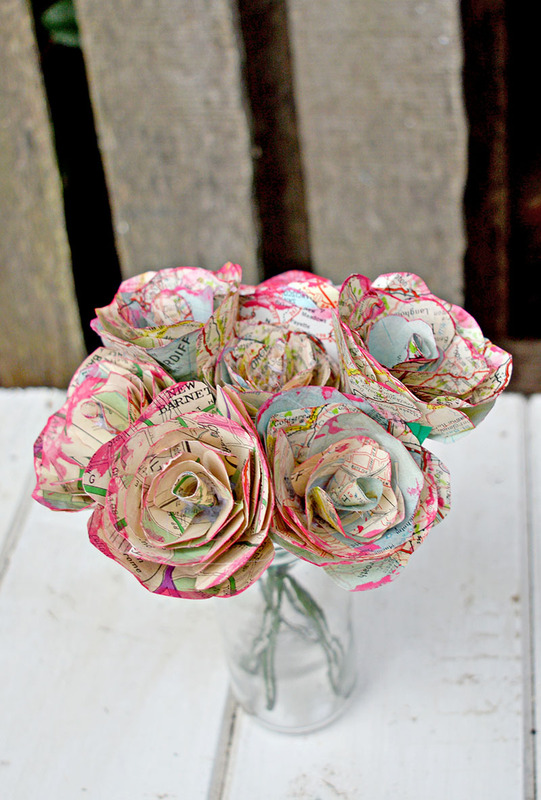 Don’t just throw away any map paper scraps use them to make some gorgeous map roses. 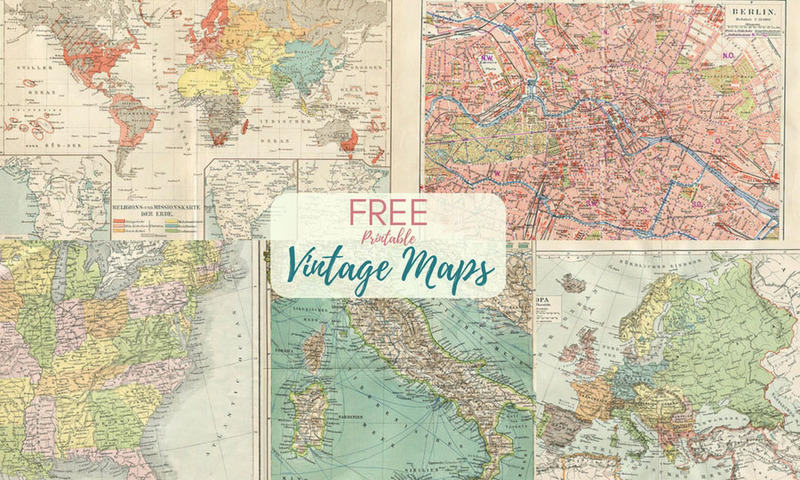 I also have some free vintage maps that you can download and use for this project. For a lot more map craft and DIY ideas check out my map page. Very pretty! 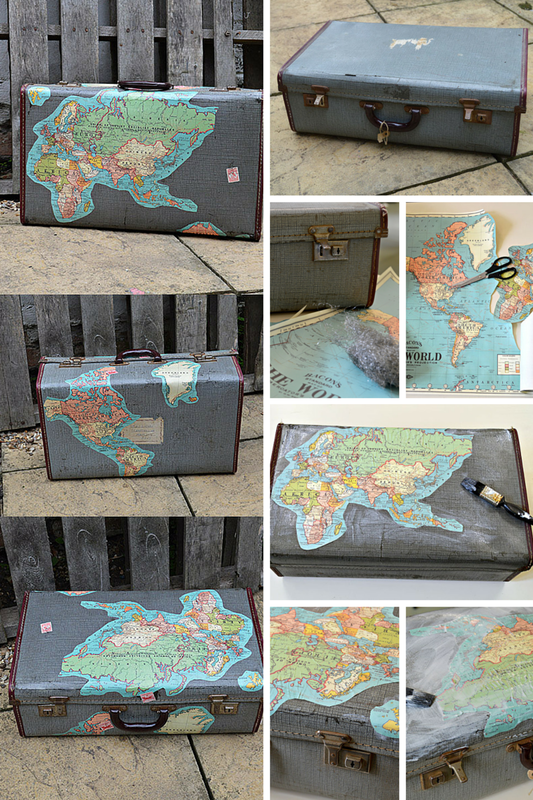 I think using a map to upcycle a vintage suitcase was the prefect choice. I love the inside as well. You did a awesome job on it! Thank you so much. 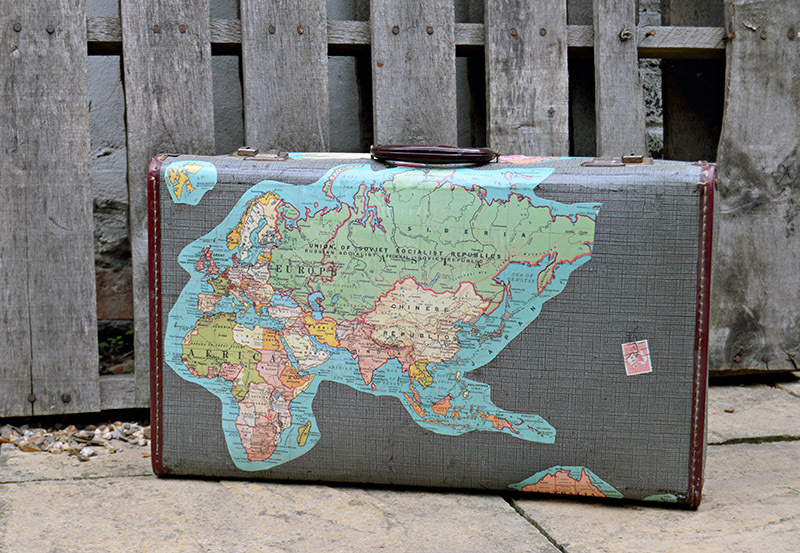 I thought maps and suitcases went well together as they are both travel themes. What a wonderful idea! I’ve always loved maps of any kind. I’m an armchair adventurer, though. When I saw your project, I immediately thought to use a suitcase lined and covered with maps for a cat bed. I’d put some kind of small pillow in it and leave it open on top of the stack of large wicker baskets I have. The cats love to be up high and I love maps–so, there ya go. Thank you! I think that would make a lovely cat bed. Thank you. Being English I’m not familiar with the term footlocker, but if you mean the big metal trunk, I use that to store the families ski clothes in. Hi. I love your suitcases!! I was wondering if I could use your photos? I work for a non-profit and we post a daily devotion everyday on Instagram and Facebook. I’m always looking for different photos to use. I wanted to ask be doing so. Thank you so much! Thank you ! You can use one photo as long as there is a direct link back to Pillar Box Blue. Thank you very much I look forward to seeing it. Love this suitcase! Maps are so fun to decorate with! Thanks for sharing at Merry Monday! Claire, what a cool way to upcycle those vintage suitcases!! Love the map lining! 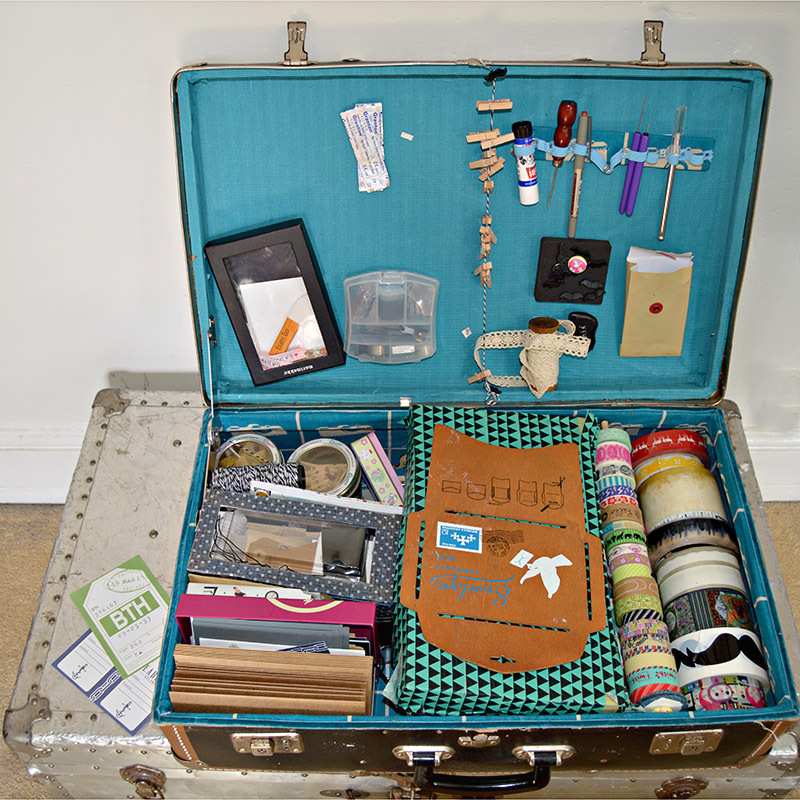 Great idea to hide the craft stash in the suitcase. 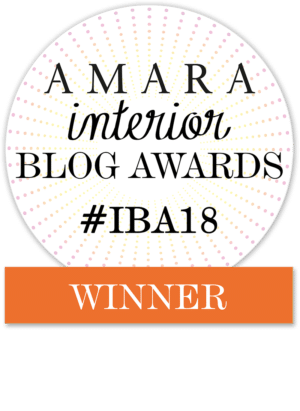 🙂 Thanks for linking up at Sweet Inspiration! Thank you very much. I stash a lot of my craft supplies in vintage suitcases, I have one just for yarn. This is absolutely fab! Love it, must give it a try. Those style of suitcases are hot property now, quite hard to get hold of reasonably priced ones! This would work great for bashed up cases in need to some love! Thank you very much! I always manage to get my cases really cheaply as I picked the more unloved ones to revamp. Thank you ! Hope you find one. I just love this! You have such a creative mind and it’s very inspiring to see the things you do. 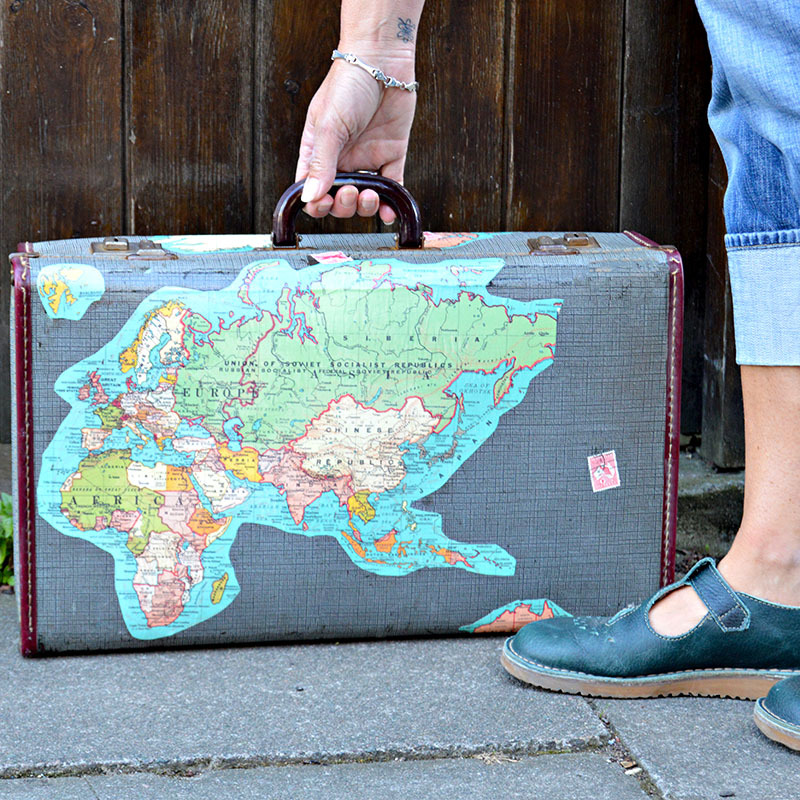 The suitcase with maps on it is darling to begin with but to use it for storage and carrying your crafty things is perfect. Thank you for your kind words. I just love making stuff. I don’t what I’m more charmed by- the inside or the outside of this suitcase project?I will be hitting the thrift stores this weekend to find my own vintage suitcase to decorate. Thanks for sharing at the #ThisIsHowWeRoll Link Party. I love it. The inside looks so cool I would be tempted to display it somewhere and leave it open. Thank you ! I love the inside too it’s a nice surprise when you open it. Hi Claire! I just popped back in to let you know that I’m featuring your fabulous suitcase at Vintage Charm tomorrow. Thanks so much for linking up your amazing projects. Thank you very much look forward to seeing it ! Oh my–I love this transformation! Great job! What a fabulous project! I thought it was so great on the outside, and then you went and did the inside with map fabric and it was like… OK… I’m totally in love now. I’ve got to find me a vintage suitcase so I can do this too. Thanks so much for sharing this at Vintage Charm Claire. Hope to see you at the next party. Thanks ! It shouldn’t be too hard to find a vintage suitcase for this project. As you are covering both the outside and inside, it doesn’t have to be perfect to start with. Thank you ! Personalising with maps is what I love to do. Thank you that is really nice to hear. Cheers ! Thanks for hosting. Thank you for selecting my post as a feature. This is great! Love the vintage suitcases paired with the maps! I just love the look of your suitcase! 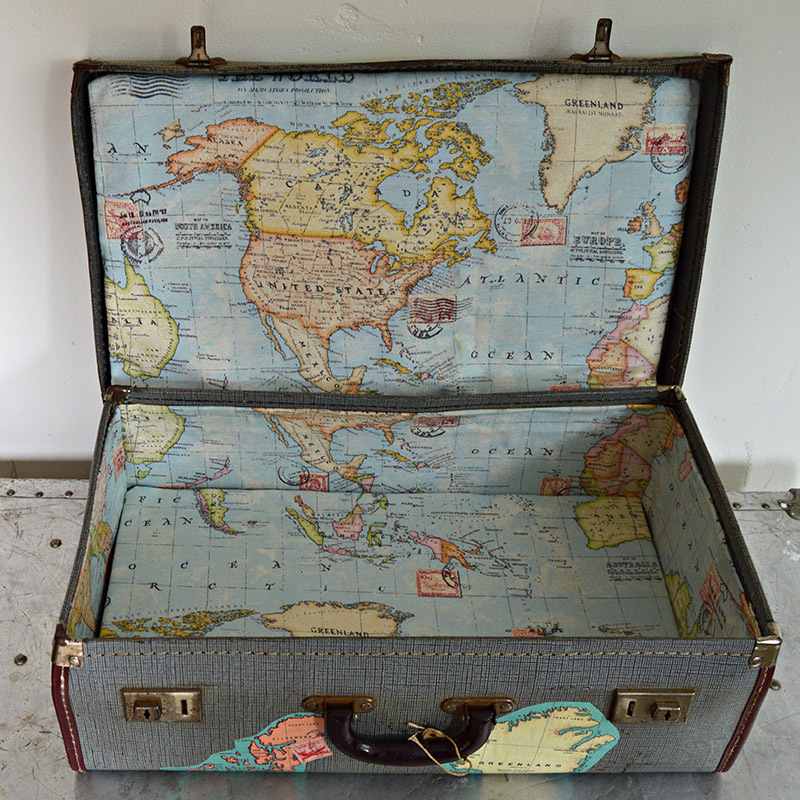 I picked up a box of maps and I have many vintage suitcases….I could do this! I always hesitate on upcycles because I am afraid I can’t do it right and in the process ruined some great vintage pieces. Your method seems easy enough! Claire, this is so darn clever! And I love the pictures where you are holding It. Really cute! Thanks so very much for sharing at Something to Talk About! Thank you very much, I just took the photo in front of a neighbours garage doors as I love the colour for background shots. Thank you, and thanks for the invite. This looks beautiful, I love the inner maps! Thank you, yes I agree the inside does look great. Fabulous, if only a suitcase this size would hold all of my travel stuff! thanks for sharing on craft schooling sunday! Thank you, you could always have another one. What a great idea. I particularly like the maps on the inside of the suitcase. Thank you, I really like the lining too it’s a nice surprise when you open up the case. Ilove your map suitcase! It matches my desk and globe lamp that I just blogged on. Thank you. Just looked at your desk and lamp they look great.